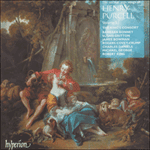 This delightfully tuneful Scottish song appears in Purcell’s hand in the Gresham Manuscript and seems to have been written for performance at an entertainment for Prince Lewis of Baden on 25 January 1694 when it was sung by the famous soprano Mrs Ayliff at the Consort in York Buildings. The song was printed in The Gentleman’s Journal for January and February 1694 which stated that the words were by ‘the Author of this Journal’, Anthony Motteux. Considering that Motteux was born in France, his knowledge of Scottish dialect is all the more remarkable. 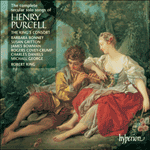 Purcell’s setting is one of his most tuneful, beautifully turned and exquisitely harmonized. Sawney is a good looking boy – who knows that he is – but the lady in question realizes that she should have no lover rather than one who is shared by twenty others, yet it is hard to adhere to that wisdom when faced with someone whom she fancies! But Sawney loves to tell. I ne’er could gang from you. It boots not to be wise.